I remember that my girlfriend had an eye on their bass player and that the singer was hanging upside down on the ceiling somewhere during one of their gigs in Amsterdam. 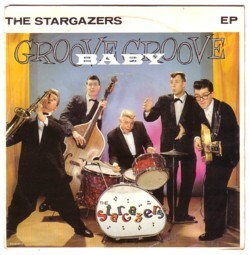 The Stargazers were a hell of a band. I heard that a few years ago they did a reunion tour, which was also good, but I didn’t went to see them. After seeing too many comebacks of my former heroes that I wish I had not seen, I have decided not to go to reunions and comebacks anymore. 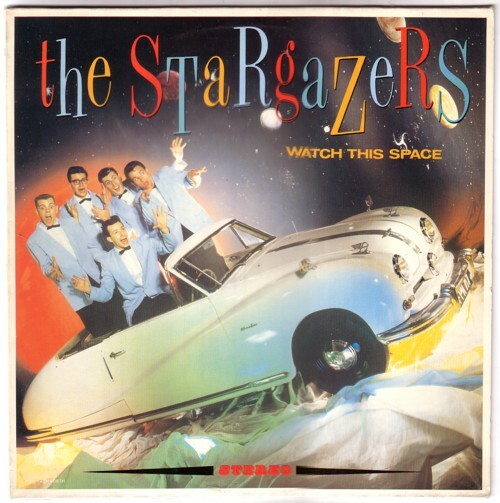 The Stargazers were a British retro rock’n’roll band, that had their first single out in 1982. And an LP in the same year. They played mainly covers, but had also a few songs of their own. I have no idea how popular they were in England, but in Holland hardly anybody knew them. Which is a pity, because their concerts were spectacular and their records are among the best in this genre. And these guys had class. Unlike most of the other records that retro r’n’r bands made in the 80’s, their artwork was so good that even today it still looks good. I wish I could say that of all the other records on that same shelf. 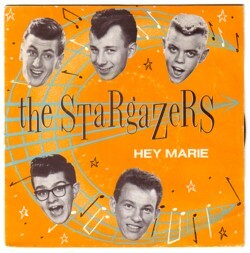 I had a friend who knew some of the members of the Stargazers. He had some demos and other recordings that he played for me at his home. But he refused to give me a tape. And he was right: I would have made copies for everybody I knew. Later some of these recordings showed up on a cassette that the band sold, “Unissued studio and live recordings “81-“83” . But I remember a lot of songs that are not on this tape.